Making a lasting and impactful first impression is crucial for any business, and the cleanliness of your office has a lot to do with that. Carpets are an excellent investment that makes a powerful imprint in the memory of just about anybody who walks into your office. Placing carpets to accentuate the look of your office is one thing, taking care of them is another. Dirty, stained carpets reflect poorly on your professionalism in addition to posing numerous health hazards. Since commercial carpets are more prone to dust and dirt, it becomes even more important to clean them on a regular basis. Unfortunately, this can take a considerable amount of effort and without the right cleaning process in place, results may turn out to be less than desirable. This is why natural products and techniques are fast being adopted by businesses concerned about the upkeep of their carpets. If you already have a commercial carpet in your office or are planning to buy one for your business, here are some natural ways to help clean it and extend its life. As basic as it gets, the first way to clean the carpet is to vacuum it regularly, ideally on a daily basis. It is advisable to invest in a good vacuum cleaner that works more effectively on larger carpet areas in offices. Make sure you clean the mesh of the vacuum in order to get rid of any dust, dirt, or other tiny items sucked into it. Another way to keep the carpet looking as good as new is to immediately clean any stains or dirt. If coffee, soil,or blood stains are spotted, the blotting technique must be used to soak up the liquid immediately. While there are solutions in the market to help remove stains even after they’re set, it is generally wiser to cure the stains immediately. Delay can make the stain more permanent and much harder to clean later. This is similar to the above cleaning tip. As soon as you find a spot on the carpet, wipe it off immediately. For any kind of dry stains, moisten the spot lightly and then blot it or use a cleaner to remove the stain. Hot water is one of the best cleaning agents and can be used for light cleaning on a regular basis. Mix water with a mild shampoo or any other cleaning solution and wash the carpets with it. Clean not only the carpets but also the floors beneath it for a much more effective cleaning experience and removal of dirt and contamination. Using a good quality enzyme cleaner can help clean carpets effectively without leaving behind any foul smells. It gets rid of all the possible odours and is tough on stains as well. Bleach is a wonderful product to be used to clean any tough stains on the carpet. There are a wide variety of bleachers available in the market. Choose and use the one that is most suitable for carpet cleaning. Using a DIY product is always cheaper than buying a commercially branded product. If cost is an issue, use white vinegar to clean the carpets. Put the vinegar on any stains and let it stand for a while, before blotting it up. A mix of vinegar and shampoo can also be used to clean the entire area. Vinegar not only cleans well but also absorbs odours and smells. Using baking soda as a cleaning agent is another effective and cost-effective DIY way to clean carpets. Sprinkle baking soda over the stained area or layer it all over the carpet and leave it for a while to work. Later, clean it with a vacuum cleaner. The baking soda makes the carpet contamination-free while effectively removing grease stains as well. The most ignored yet unavoidable technique in cleaning is drying. Once the carpet is cleaned, it is also vital to dry it properly. Wet areas tend to attract more germs and can become a breeding place for bacteria. Air dry the carpet and the floor after it is cleaned with any wet ingredients. Another basic tip but one that cannot be ignored. This simple yet effective technique of dusting at regular intervals prevents dust particles and other items from settling. You can simply use a dusting cloth to remove dust from the carpet. A technique used by most professional cleaning services, where, after the basic cleaning, the carpet is cleaned with some fresheners or essential oils to give it that extra touch, making it look fresher and brand new, while also keeping it germ-free. An advantage is that such fresheners are capable of getting rid of any odour that might have still been left behind after cleaning. While it does take some effort and regular monitoring to keep carpets looking spotless and in shape, leaving them unattended can actually harm your health as well as that of your employees and any other person coming in contact with it. 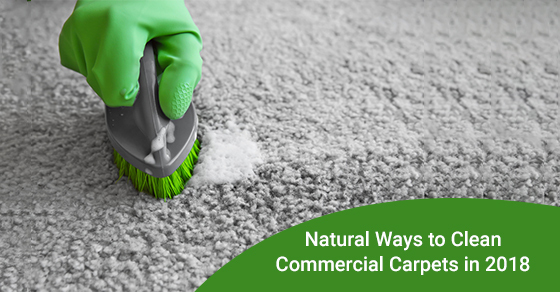 Whether you’re doing the carpet cleaning yourself or looking to hire a commercial cleaning company for the purpose, ensure that only natural ways of cleaning are adopted. Using heavy chemical-based or other artificial cleaning methods will not only damage the carpet in the long run but can also have an adverse impact on the health of your employees. For more information about environmentally conscious commercial cleaning, call Sunrise-Cleaning at 1-866-278-8208 today or contact us here.